Upsurge of workers’ struggles in 2015 in Mexico, from field workers in San Quintin, Baja California to maquiladora workers in Ciudad Juarez along with ongoing opposition to government educational “reforms” by teachers in the autonomous union CNTE, demonstrate workers’ resistance to the plans of capital and its state. How can organizations of activist-thinkers meet what workers have achieved in our own organizational response? Workers in four maquiladoras in Ciudad Juarez began organizing to form an independent union and for higher wages, better working conditions and against sexual harassment. 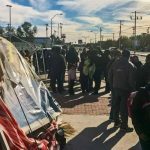 San Francisco, Cal.—The Mexico-U.S. Solidarity Network (mexicosolidarity.org) sponsored a tour for Ciudad Juárez activists Verónica Leyva and Felix Pérez. Below we print excerpts of their talk given in San Francisco in November.